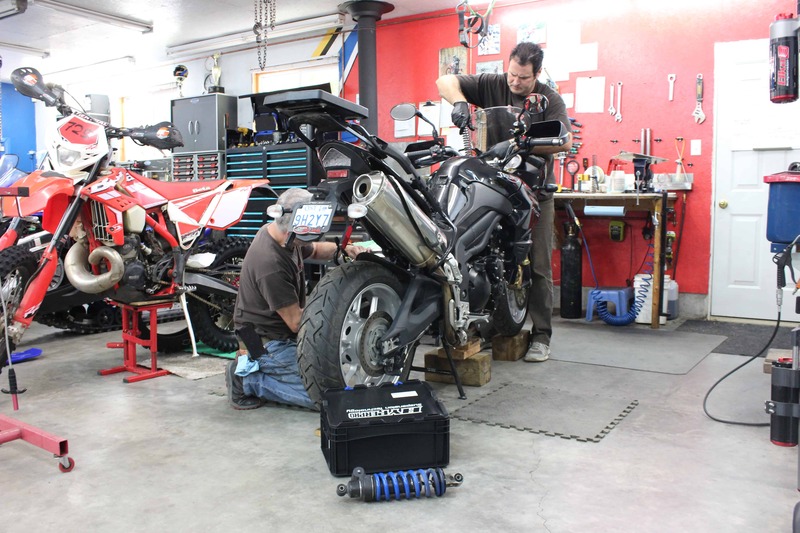 In our last article, we discussed the rear wheel dyno and how it is operated to test a motorcycle for horsepower. We mentioned how the operator loads the bike on the dyno and goes through the procedure to acquire a base run. A ‘base run’ is what we refer to as the first usable dyno result from a given motorcycle before we do any changes or tuning whatsoever. For the sake of repeatability and ease, this run is always done at full throttle. As I mentioned before, the highest horsepower reading from your bike will never be attained on the first ‘pull’ from the dyno as the engine is still cold, the combustion chamber is cold, the oil is cold etc., etc. The peak power will continue to go up for three or four runs (or more) until the engine gets too hot, then power will go down. The dyno software will leave all of your runs up on the screen and from there you can pick the highest and cleanest to represent your ‘base run’. As you save these runs, you can change the name from the numerically climbing default to something you can remember to go back to as your beginning setting. Most Dynos will have the Exhaust Gas Analyser feature as an add on, which allows you, in layman’s terms, to stuff a small diameter pipe up the exhaust and monitor the air/fuel ratio during the run. This device detects the amount of unburnt fuel in the exhaust to help you determine if the motorcycle is running rich or lean. If you took the time to hook the rpm lead up to your bike before doing the run, you now can correlate exactly at which rpm the bike is rich or lean for this WOT (wide open throttle) run. This information can help you troubleshoot problems or give you invaluable tuning information. There are several manufacturers of Dynamometers out there, but the Dyno Jet Dynamometer is by far the most popular. A match seemingly made in marketer’s heaven, Dyno Jet sells the Power Commander (PC) for Fuel injected Motorcycles. Not really an ECU, the Power Commander is more accurately called a ‘fooler’ box. Quite tidy, it connects in line between your ECU and your throttle bodies using OEM style connectors, taking literally minutes to install. Your ECU or black box has it’s own base map from the factory to control the duration of the fuel injectors for every rpm and throttle position. 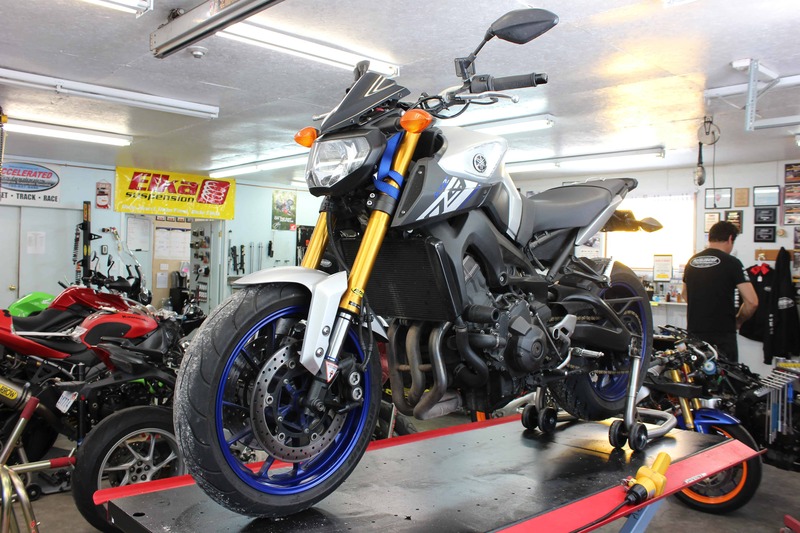 Fuel injection in essence is very simple, the motorcycle’s ECU simply holds the pressurized fuel injector open for a certain amount of time at the right time in the combustion cycle. If it holds it open for a too short a time, the bike will be lean, if it holds it open for too long, the bike will be rich. The Power Commander simply adjusts this duration at each particular rpm/throttle position point. In it’s memory, the PC will have a Excel looking spreadsheet that contains a cell for every rpm from idle to redline in 250 or 500 rpm increments on one axis and Throttle positions on the other axis in increments of 0 (idle) 2%, 5%, 10%, 20%, 40%, 60%, 80%, 100%. Each of these cells contains a zero when the power commander is new, ready and able to add or remove fuel at each of these zones depending on your requirements. The owner of the Dyno Jet Power Commander can either make detailed changes using a laptop, or make large scale coarse changes using one of three buttons on the unit itself. 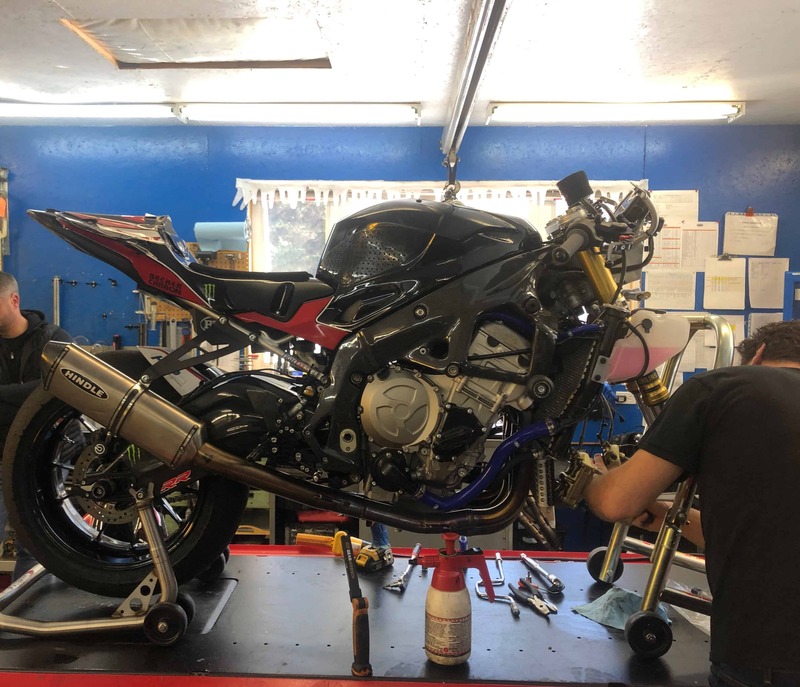 The other option is to download maps off of Power Commander’s Website that they or other members have custom made to specific Modifications for their bike, such as “06 GSXR600 with a full Hindle Pipe and a K+N Air filter”. A word of caution though, even though this may match your modifications perfectly, that map may have been created at night, in Colorado, in January using Husky mid grade fuel. It is always best to finish your modifications, fill up with your favourite fuel and head off the local dyno (in your area) for a custom map for your bike. The old School method of correcting your air/fuel(AF) ratio was to do a run, look at the AF ratio that the dyno had recorded, then hook your computer into the Power Commander and correct cell by cell the mixture by adding or removing fuel as you guessed was correct. This was very time consuming and only addressed the mixture at full throttle. Mostly this was deemed sufficient as most customers only cared about the peak HP number attained at WOT for their bike, ignoring that they spent 1% of their time at full throttle on the street, but 40% of their time at 4000 rpm and 20% throttle. Then, technology moved forward and Dyno Jet brought out their “Tuning Link” program. This program necessitated that the Dynos have a sophisticated Electronic brake that could hold a high horsepower bike under full throttle at a steady rpm for a few seconds while the Dyno read the AF ratio, calculated a correction and uploaded it into your USB capable Power Commander all in a second or two. 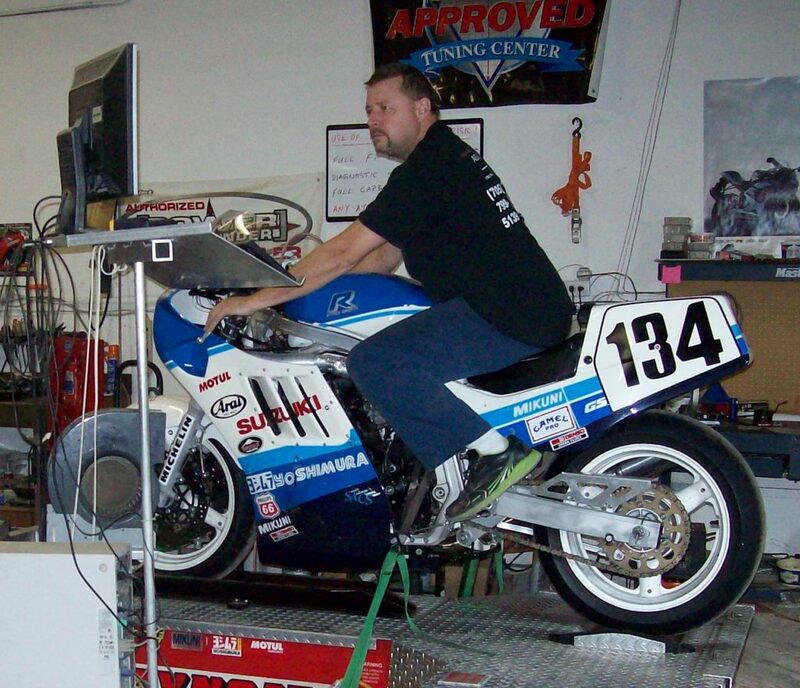 The new Tuning Link software would then allow the bike to step up to the next rpm cell and repeat the test over again until all cells in that rpm band were mapped to perfection. For the next run, the operator held the bike at 80% throttle and the Tuning link software repeated the procedure perfectly mapping the AF ratio at all rpm points, continuing on with 60,40 20, 10, 5 and 2% until you had a perfect map for your bike, all in under an hour, instead of the better part of a day. Isn’t technology cool? Please remember to send me any of your technical questions to johns@insidetrackpublications.com. Thanks and until next month, ride safe!